After my wife Yoke-Sim and I settled down in Central Queensland in 1976, we decided to get better acquainted with our adopted land by criss-crossing the big island (continent?). Since I had considerable experience exploring the United States by Greyhound during my year (1966-67) with the World Press Institute, I convinced Yoke-Sim that we should explore Australia by coach to get a better feel of our new country. Moreover, our transportation would be quite inexpensive because each could purchase a $225 Aussiepass or Eaglepass for unlimited travel for a month. Accommodation would also cost less because our travel would entail sleepovers aboard the bus several nights. Aussie Explorer Pass on predetermined routes. The All Australian Pass, valid for 12 months, cost $2,998. Aussie Kilometer Pass starting at 2,000km and increasing in blocks of 1,000km to a maximum of 20,000km. Price ranged from $382 for 2,000km to $2,239 for 20,000km. Valid for 12 months. Mixing business with pleasure, we set off on a month-long bus tour of Australia leaving our home in Rockhampton Saturday 9 December 1978. We traveled about 17,000 km on this trip, enjoyed meeting and hobnobbing with numerous “Crocodile Dundees” (a term that became synonymous with folks in the Aussie outback less than a decade later with Paul Hogan’s 1986 movie), and suffered the sorrows of all bus travelers on bumpy outback roads like the Stuart Highway. From Rockhampton, Qld., to Perth, WA-“”…”a distance of 5,600 km””‚through New South Wales (Armidale, Dubbo, Broken Hill) and South Australia (Adelaide, Ceduna). From Perth, WA, to Darwin, NT””‚a distance of 6,300 km””‚through South Australia (Adelaide, Coober Pedy) and lower Northern Territory (Ayers Rock, Alice Springs). From Darwin, NT, to Rockhampton, Qld.””‚a distance of 4,000 km””‚through lower Northern Territory (Tennant Creek), northwestern and northern Queensland (Mount Isa, Cairns, Townsville, Marlborough). The Ansett Pioneer Express picked us up at the Leichardt Hotel in Rockhampton (current population 60,000, about 8,000 more than in 1978) at 1.30 a.m. on Saturday (9 Dec.) and we were on the way on our long journey West. I recalled the famous advice that New York Tribune editor Horace Greeley gave in an 1851 editorial: “Go West, young man.” As a journalist, I was happy to follow Greeley’s exhortation because Australia’s pioneer country was also its West. After a brief stop in Bundaberg, Qld., the coach arrived in the Queensland capital of Brisbane (current metro population of 1.9 million) at 12.15 p.m. We figured out that since it took the bus almost 11 hours to cover the 616 km from Rockhampton, our road speed would be about 56 k.p.h. Our plan was to stay overnight in Brisbane at the University of Queensland International House and to eat dinner with a few Thai students attending UQ. The next day, after we ate a hearty breakfast at the International House, a friend brought us to the Ansett terminal, where we got on a Melbourne-bound coach to continue our journey. The coach captain drove 125 km west to Toowoomba and another 83 km south to Warwick, where he stopped for lunch before crossing the Queensland border to New South Wales. Our dinner stop was Armidale (population 19,500), the home of the University of New England, 308 km south of Warwick. The stop, north of the town, was close to a motel in peaceful surroundings. An elderly lady from Toowoomba who was going to Melbourne to see her grandchildren joined us for dinner. From Armidale, our tour route took a southwestern direction. Our coach captain handed over his driving seat to a new one at Tamworth, 112 km further away. He explained that safety precautions did not permit any coach captain to drive more than 700 km a day. Although it was 9 p.m., the new driver put on some soothing music to lull us into sleep. Our coach arrived in Dubbo, NSW (population 30,200)””‚342 km southwest of Tamworth””‚at 1.30 a.m. the next day. Those heading west had to disembark here while those going southeast to Melbourne remained in the same coach. The 261 km stretch of the Barrier Highway from Cobar to Wilcannia, NSW, turned out to be to be “a cockatoo (galah) paradise” with birds crossing the road quite often. (Bird lovers, please note.) The re-fuelling stop in Wilcannia enabled me to take a quick shave. Our driver covered another 196 km west on Silver City Highway to reach the isolated mining center of Broken Hill (population 18,900), the last NSW town near the South Australia border. BHP Billiton, the world’s largest mining company, had its roots here. We ate lunch at the Barrier Social Democratic Club (218 Archer St.). I ate a porterhouse steak while Yoke-Sim preferred fish and chips. A new driver took over the coach to take us all the way to the South Australian capital of Adelaide (metro population 1.3 million), another 511 km to the southwest. We checked in at the Plaza Hotel, east of the Rundle Mall, to rest and recuperate and prepare ourselves for crossing the Nullarbor the next day. At Ceduna (population 2,300), where the local water supply was so salty as to be undrinkable, Yoke-Sim and I prepared our own sandwiches for dinner from groceries we purchased in Port Augusta (population 13,300). After dinner, the new driver who took charge of the coach advised us to take a good look at our right and at our left “and then go to sleep because the next few hundred miles would look exactly the same.” The Nullarbor is roughly the plain stretching 1,142 km from Ceduna to Norseman, immediately north of the Great Australian Bight. But crossing the Nullarbor (treeless) Plain is a matter of great pride for the Crocodile Dundees. The Eyre Highway, opened in 1941, connecting Norseman, WA, with Port Augusta, SA, enabled the crossing of the Nullarbor. The next driver, who took over the coach in Madura, a roadhouse community, while most of us were fast asleep, stopped at Caiguna for those who wanted to get refreshments. At Norseman (population 1,000), our breakfast stop, I had enough time to shave and refresh myself. Before he left us in Kalgoorlie, this driver gave us interesting accounts of Kambalda, Boulder and Kalgoorlie as we reached these towns. Kambalda (population 4,300), located on the western edge of Lake Lefroy, a large 510-square km salt lake, is a mining town divided into East and West within the Goldfields-Esperance region. Percy Larkin, a gold prospector, initiated the settlement at the base of Red Hill in 1897. Kalgoorlie-Boulder (population 28,300) was founded in 1893 during the Yilgarn-Goldfields gold rush after three prospectors””‚Paddy Hannan, Tom Flanagan and Dan O’Shea””‚found signs of gold in the area when one of their horses cast a shoe. The town grew as a mining center ever since. The Super Pit is the main attraction in Kalgoorlie. Other places of interest include its Hay Street (named after Hay Street, Perth) brothels; its two-up (an Aussie gambling game involving coin throwing) school; the goldfields railway loop line; the Kalgoorlie Town Hall; the Paddy Hannan statue/drinking fountain; and the Mt Charlotte lookout. One of its infamous brothels also serves as a museum and is a major national attraction. We decided to explore Kalgoorlie on our return journey. The last driver took us all the way from Kalgoorlie to Perth. For me, the long water pipeline, designed by C. Y. O’Connor to bring in fresh water from Mundaring Weir near Perth, was an eyesore. Yoke-Sim took advantage of our lunch stop, Merredin, to buy some essential groceries. We reached the Western Australian capital of Perth (metro population 1.6 million) about 6 p.m.
Doug White of Mount Lawley CAE (subsequently renamed Edith Cowan University), an AATEJ representative, met us in Perth and took us to the Ocean Beach Hotel in Cottesloe (between Perth and Fremantle) for us to rest and recover from fatigue. Yoke-Sim prepared our dinner. Later, we went for a leisurely stroll on the beach and joined the teenyboppers at the hotel for a drink. As we discovered soon, Cottesloe (named after an Aussie prime minister) was the best deal we had in the West. Ocean Beach Hotel still exists. 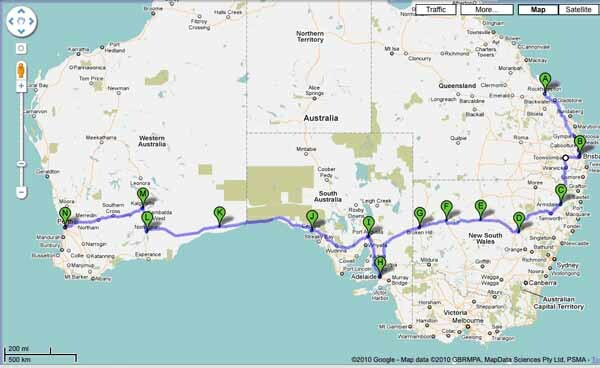 Figure 1: Our 5,600 km bus tour from Rockhampton, Queensland, to Perth, Western Australia.